Puricom Water Industrial Corporation was founded in 1989 in Taiwan. The main Puricom consultant, Matthew Barta is the highest level certified water specialist and has helped develop water filtration systems all around the world, including such challenging areas like South East Asia, India, Africa, and many others. Matthew was a missionary in Taiwan when he coordinated water filtration projects with his three children, all working with humanitarian aid projects in Africa. 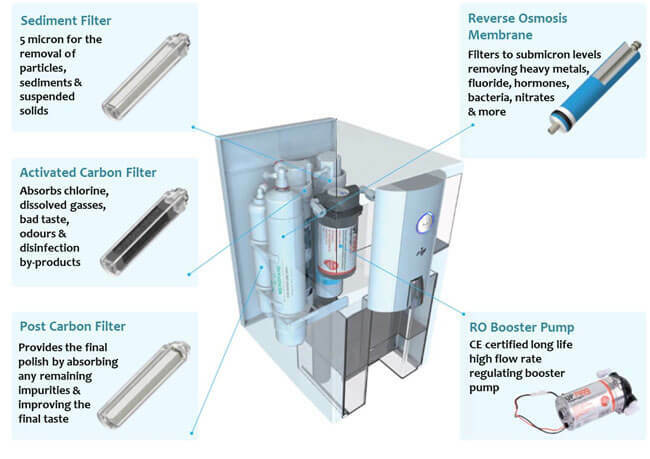 In collaboration with entrepreneur Eric Kurbanov, Matthew and Puricom designed the Zip Zero Installation Purifier, developing an RO (reverse osmosis) system that pretty much anyone could benefit from. The company doesn’t see ZIP as just a water filter. They state it’s a crucial companion for a long and healthy lifestyle. As a biology major, Matthew Barta puts a great emphasis on health and nutrition and incorporates that vision into his designs. Read our PuricomUSA review to find out everything about their revolutionary product and service. PuricomUSA team is dedicated not just to preserving our health but also the environment. Their Zip water filter reflects this dedication with every feature. 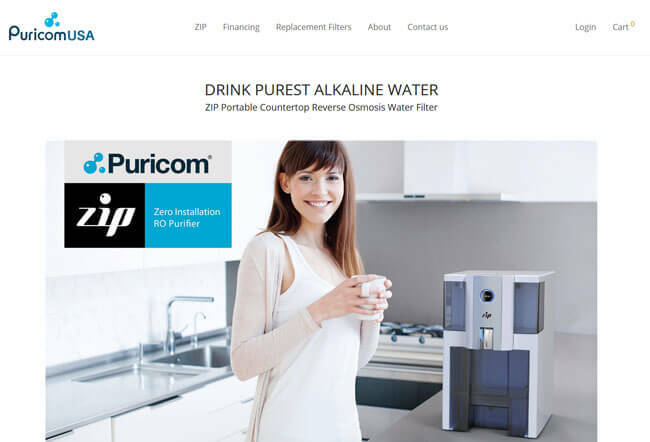 As mentioned before in this PuricomUSA review, the Zip Countertop Reverse Osmosis Water Filter is much more than a simple water purification unit, so we’ll create a basic outline of the features you can expect for the money invested. No installation – Unlike similar products, ZIP doesn’t require any installation whatsoever. One can characterize it as a plug-n-play water filter. Traditional filtration systems have to be plugged into your plumbing, making them difficult to install and impossible to move around as you see fit. Not to mention that you can’t install them yourself unless you happen to be a combination of a plumber and water filtration technician. 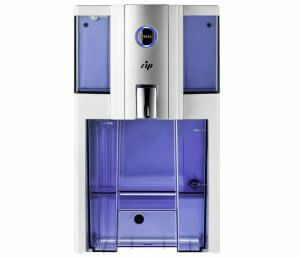 This makes Zip water filter a much easier and cheaper solution when it comes to providing you with pure drinking water. Reverse osmosis water filter – Osmosis is characterized as a process that “brings water back to life.” Osmosis and reverse osmosis are processes that happen naturally in our bodies. Normal osmosis moves water or other liquids from a low-concentration solution on the one side of the semi-permeable membrane to the side with higher concentration until both of them reach perfect equilibrium. A reverse osmosis filter, on the other hand, forces water in the opposite direction through the semi-porous membrane. The membrane features holes that let water through but stop all the impurities and other elements from entering. Pure water leaves the high-pressure side of the membrane and moves to the side with the lower pressure. The unpurified water gets flushed through the drain alongside other impurities. Alkaline water (7-8 PH) – Alkaline water is less acidic than your regular tap water, which means it’ll be rich in alkalizing compounds like magnesium, potassium, silica, calcium, and bicarbonate. Decent reservoir – Zip water filter can hold up to 1 gallon of water. High production – The filter can produce up to 75 gallons of water per day. A high percentage of impurity removal – Zip water filter removes up to 99% of all known water contaminants, including Chlorine, Fluoride, heavy metals, and others. The top and bottom containers are completely BPA-free and can be easily removed and cleaned with ordinary dish soap. Portability – Zip filter is very easy to move around since it doesn’t require any installation. DIY maintenance – You can easily change the filters yourself. Zip utilizes quick connecting fittings, so you won’t even need any dedicated tools. The whole operation takes only a couple of minutes. technician. The filters need to be changed once a year and the reverse osmosis membrane can last up to 4 years. Environmentally friendly – PuricomUSA takes great care of the environment and this product certainly reflects their dedication to preserving nature. Economic – The filter uses only 24w of electrical power, which is less than a usual lightbulb. It also has the best recovery rate among water filters (50% – 1:1). Attractive design – The filter will look great in your kitchen with its modern coffee maker design. Furthermore, since it doesn’t have to connect to your plumbing, it’ll save you from leaky diverter valves, bulky hoses, and other instruments you’d have to use to attach a water filter to your faucet. Zip comes with a 1-year unconditional money back guarantee, which also includes a warranty. After 30 days of purchase for refunded orders, the buyer pays the shipping cost while warranty replacements come with free shipping. 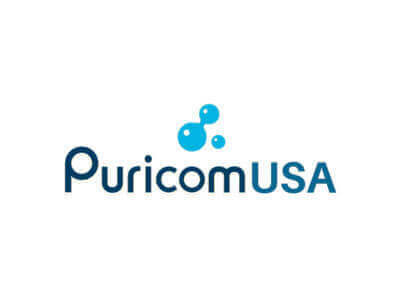 The only information offered by the PuricomUSA website is that they ship their products from Fort Myers, FL, within 1-5 business days after you’ve placed your order. Zip Countertop Reverse Osmosis Water Filter is one of the best products for water filtration we’ve seen in a while. This PuricomUSA review showed a mobile and easy-to-use product that removes almost all impurities from your drinking water. Things like Chlorine and Fluoride are not healthy for us, no matter what the governments try to make us believe, so a handy water filtration system should be an essential part of every household. I set it up in just a couple of minute after watching the instructions video on the site. It works perfectly and the water tastes great. Awesome little water filter but I wish it could hold more water. This machine saved me half an hour every day to hop to the store for a reverse osmosis refill. It’ll also save me tone of cash in the long run. No leaky pipes no nothing. I can move it around as much as i and it looks great. Neighbors didn’t know what it was until I told them.